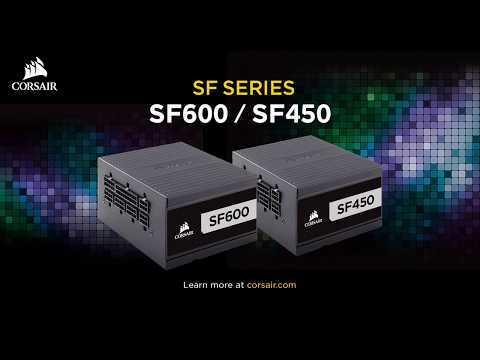 Corsair SFX 600W Power SupplyCORSAIR SF Series SFX power supplies offer all the performance of an elite 80 PLUS Platinum efficient PSU, in a small form factor ready to power your high performance PC. Fully modular braided cables allow you to maximize space and improve airflow inside your PC by only using those you need, for a show-ready system that’s ready to turn heads. 105°C rated Japanese capacitors and premium electrical components ensure superior performance for years of stable and dependable operation, while a low-noise 92mm cooling fan equipped with a zero-RPM mode, ensures cool and quiet operation. Compact, quiet and built to perform, the SF Series is the perfect choice to power the world’s best small form factor PCs. KEEP YOUR BUILD LOOKING CLEAN The fully modular design of the SFX power supply means that during your build you can mount the PSU in the case first and then attatch only the cables you need, making builds and upgrades easy with great looking results. Simply connect the cables you need and keep the rest safe for future upgrades. SEVEN-YEAR WARRANTY A 125mm-long casing ensures an easy fit in almost all modern enthusiast PC cases. Your guarantee of reliable operation that will last across several system builds. Individually Sleeved Cables Only connect the cables your system needs, making clean and tidy builds easier whilst improving airflow. SF PLATINUM Series power supplies come equipped with premium individually sleeved cables featuring a flexible paracord sleeve, ready to become part of your new high-end PC. 92mm Cooling Fan The SF PLATINUM Series upgrades the SFX-standard 80mm fan to 92mm, reducing noise and improving performance at demanding loads. SF SERIES POWER SF PLATINUM Series power supplies include an SFX-to-ATX power supply adapter bracket that allows installation into any ATX compatible case. The new bracket offsets the mounting location, allowing for more space inside any standard ATX chassis, so you can tuck your excess cables out of the airflow path. 80 PLUS PLATINUM CertifiedPlatinum certification ensures high efficiency operation for less excess heat and lower operating costs.